The optimism surrounding the election of a new government in Alberta will soon be challenged by the need to address the budgetary legacy of the previous government. Barring unexpectedly rapid improvements in the energy sector, the Notley government will be forced to address not only the massive revenue hole resulting from the precipitous drop in resource revenues that began in the fall of 2014, but also a structural deficit that emerged even when resource prices were high. The implications of this unattractive fiscal situation are obvious: Albertans will be faced with significant cuts to provincial public services or they will face higher taxes. Simply maintaining the current (but already somewhat reduced) level of public services will necessitate imposing higher taxes on the broad majority of Albertans, in addition to the tax increases on the highest income earners and corporations already introduced by the new government. In this context, there are a variety of public policy options available, but the prospect of some tax increases and perhaps even the introduction of a low provincial sales tax, stand out. Even if such policies are implemented, Alberta will maintain a considerable tax advantage over other provinces. This report documents the historical record, assesses the magnitude of the Government of Alberta’s budget problem, looks at budget projections for the next five years under various scenarios, illustrates a set of revenue options should Albertans be adverse to “massive cuts,” and draws conclusions. Contrary to the expectations and beliefs of many, Alberta’s spending on provincial government programs is very average. Over the past 20 years, Alberta has never had the highest per capita program spending among the provinces; rather, it has ranked about fourth in spending, and its expenditures have averaged only 3.2% above the Canadian provincial average. Provincial program expenditures in Alberta tend to be consistently close to 20% of household income since 1993–94, a period that encompasses a broad range of economic conditions and fiscal circumstances. This level is somewhat below the 10-province average and about equal to that in Ontario. In 2014–15, Alberta’s program expenditure level was 18.7% of household income. The Government of Alberta’s revenues are comparatively erratic relative to the other Canadian provinces due to the volatility of resource revenues. Alberta’s resource revenues surged during most of the first decade of this century, but since 2009–10 resource revenues relative to household income returned back to the pre-boom levels of the 1990s. The out-of-pocket contribution of Albertans to provincial coffers trended downward after 2000. That is, the tax load of Albertans has declined since 2000. Savings over almost a decade of resource boom left Alberta with exceptional levels of net financial assets. Those have declined since 2009 as a result of drawing upon financial assets to fund spending and due to increased borrowing. Nonetheless, Alberta is still unique among provinces in having financial assets in excess of its debt. Looking Ahead in a Low Energy Price Environment: How Big is the Problem? Lower oil prices are expected to result in provincial revenues $7.2 billion lower in 2015–16 than in 2014–15 (about 16% of total expenses). The spring fiscal initiatives of the Notley government will reduce the revenue hole by about $2.1 billion once fully implemented in 2016–17, but even with these measures an annual $5 billion budget gap remains. However, the budget problem is actually larger than this. Alberta has been borrowing to support capital (infrastructure) spending, and that is projected to continue at over $5 billion annually for several years. Debt was $4.6 billion in 2011–12, is expected to reach $18.3 billion in 2015–16 and is projected to reach (but will likely exceed) $31.2 billion in 2018–19. That this policy of borrowing to finance capital spending was initiated when resource revenues were large indicates a structural deficit. Continuation of the policy of borrowing for capital implies accumulating a permanent debt equal to the province’s capital stock. To overcome the revenue hole stemming from low oil prices and to avoid adding to provincial debt, the government faces a larger fiscal problem – a problem perhaps as much as twice the size of that usually indicated, that is, about $10 billion a year. Revenues projected in this report come from the Prentice budget of March 2015 adjusted for the tax initiatives introduced by the Notley government in the spring session of the legislature. Six expenditure scenarios are outlined: four are generic and two evolve from the election campaign (that of the Prentice budget and that implied by the NDP platform). The key questions addressed in the budgetary alternatives section of the report include: How do the revenues projected under the Notley government’s June revenue regime compare with the expenditures projected under the various spending scenarios? Will the projected revenues meet expenditures or will there be a gap, and, if so, how big? The documented plans extend to 2019–20 and, because policies take time to come into effect, the consequences are estimated for that date. Both the Prentice budget and the NDP platform imply significant cuts in program spending if no further revenue initiatives are implemented. Program expenditures would fall to 16% and 17% of household income, respectively, compared to the long-term average of 20.3% and the 2014–15 level of 18.7%. Both levels are lower than the 18.3% experienced during the depth of the Klein era cuts. It is clear that if Albertans prefer maintaining services at the 2014–15 levels – that is, 18.7% of household income – then additional revenues will be required. What options are available to raise the revenue needed to support the provincial programs and services? The Alberta government, like any other government, has at its disposal the ability to increase corporate and personal income taxes, as well as sales taxes, special fees, levies, and surcharges. Any decisions ultimately made on this front will involve a complex array of political and economic factors. This report does not prescribe decisions for the government, but rather outlines the broad contours of available policy options and illustrates one scenario capable of maintaining the current level of services. 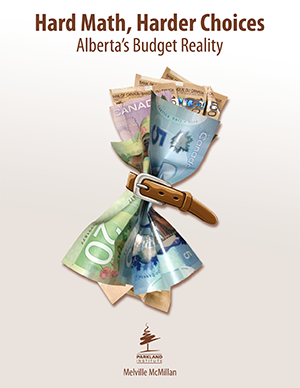 The recent collapse of oil prices is forcing Albertans to reassess the province’s fiscal situation. The Prentice government acknowledged the full nature and extent of the problem, but events have left the unenviable task of finding a solution in the hands of the Notley government. The analysis in this report suggests that the choices facing Alberta are not appealing, and that some move to higher taxes, and taxes necessarily borne by typical Albertans, is probable. In fact, given the forecasts for the Alberta economy, higher taxes will be necessary if Alberta is to overcome the drop in resource revenues and stop accumulating debt – that is, put the province on a sustainable fiscal path – without a significant reduction in services. On the positive side, a sufficient increase would still leave the tax levels of Albertans no greater than during the pre-boom level of the late 1990s. The expected extent of tax increases will reduce but certainly not eliminate Alberta’s tax advantage relative to other provinces. Such a narrowing should not be a surprise. If, as anticipated, resource revenues have difficulty maintaining their relative importance in the Alberta fiscal base, Alberta’s tax structure will need to become more like that of other provinces. Melville McMillan is Professor Emeritus and Fellow of Institute for Public Economics in the Department of Economics at the University of Alberta.